June is National Fresh Fruit and Vegetable Month, so why don’t you challenge yourself to eat more fresh produce this month! 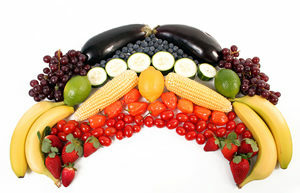 Fruits and vegetables are nutrient-dense, which means they provide lots of vitamins and minerals with fewer calories. They also contain fiber to keep you feeling full, and antioxidants that may protect you against certain chronic diseases such as cancer or heart disease. The USDA MyPlate guidelines recommend filling half of your plate with fruits and vegetables. That means most of us should eat 1.5-2 cups of fruit per day AND 2-3 cups of vegetables per day. If you choose, you can consume fruits and vegetables that are canned, frozen, dried, and in 100% juices. Meeting the USDA guidelines can be met by making a few small changes to your diet. Add fruit, such as bananas, strawberries, or blueberries, to your cereal or oatmeal in the morning. Add extra vegetables to your sandwich at lunch, such as tomatoes, cucumbers, lettuce, onions or avocado. Instead of dipping pretzels or crackers in hummus, use red pepper strips or carrot or celery sticks. Sneak vegetables into your favorite dishes. For example, add mashed cauliflower to your macaroni and cheese for more nutrition and fewer calories. Or add broccoli to whole wheat pasta dishes. Visit a Farmer’s Market- children can be on a scavenger hunt for a certain colored new fruit or veggie to try or have them find a rainbow of produce. Make Fruit Wands- Stack a variety of cut up fruits on a kabob stick and top with a slice of star fruit for a magical and tasty treat. Plant a Veggie Garden- Planting vegetables can be a great way to increase your child’s interest in trying new, healthy foods. Veggie Builders- Make a variety of veggie buildings, animals and people out of cut up vegetables, tooth picks and cream cheese for the “glue”. Make Fruit “Sundaes”- Layer fruit, low fat yogurt, nuts and crunchy cereal in a glass and enjoy! Discover fast ways to cook: Cook fresh or frozen vegetables in the microwave for a quick-and-easy dish to add to any meal. Steam green beans, carrots, or broccoli in a bowl with a small amount of water in the microwave for a quick side dish. Be ahead of the game: Cut up a batch of bell peppers, carrots, or broccoli. Pre-package them to use when time is limited. You can enjoy them on a salad, with hummus, or in a veggie wrap. Choose vegetables rich in color: Brighten your plate with vegetables that are red, orange, or dark green. They are full of vitamins and minerals. Try acorn squash, cherry tomatoes, sweet potatoes, or collard greens. They not only taste great but also are good for you, too. Check the freezer aisle: Frozen vegetables are quick and easy to use and are just as nutritious as fresh veggies. Try adding frozen corn, peas, green beans, spinach, or sugar snap peas to some of your favorite dishes or eat as a side dish. Make your garden salad glow with color: Brighten your salad by using colorful vegetables such as black beans, sliced red bell peppers, shredded radishes, chopped red cabbage, or watercress. Your salad will not only look good but taste good, too. Sip on some vegetable soup: Try tomato, butternut squash, or garden vegetable soup. Look for reduced- or low-sodium soups. Savor the flavor of seasonal vegetables: Buy vegetables that are in season for maximum flavor at a lower cost. Check your local supermarket specials for the best-in-season buys. Or visit your local farmer’s market.